The catalogue of the archive of human and medical geneticists Sir Walter Bodmer and Lady Julia Bodmer is now available to researchers, which you can view here. The project to catalogue the papers comes under our Saving Oxford Medicine initiative, which aims to record key sources for the recent history of medicine in Oxford. The Bodmer archive has been catalogued during a time of wider national effort by archivists to preserve the documentary heritage of genetics and genomics, and has been generously supported by the Wellcome Trust. Comprising over 2200 boxes, the archive makes for a comprehensive and fascinating resource, particularly for historians of science and medicine. The archive documents Sir Walter’s path to becoming one of the leading international experts in population, human and cancer genetics, and represents his full career, from school days in Manchester in the early 1950s; Stanford University (1961-69); Oxford University (1970-79); Imperial Cancer Research Fund, London (1980-1996) and back to Oxford as Principal of Hertford (1996-2005). The papers also include material relating to his more recent work at the Immunogenetics Laboratory at the Weatherall Institute of Molecular Medicine in Oxford, which he jointly headed with his wife, Julia Bodmer. The collection additionally documents Walter Bodmer’s contributions to national science policy, international cooperation in science and extending public interest in science, and papers include extensive correspondence, administrative records and papers reflecting his major responsibilities, which included his presidency of HUGO, chairmanship of the Board of Trustees of the Natural History Museum, chairmanships of the British Association for the Advancement of Science and the National Radiological Protection Board, and trusteeships at Sir John Soanes Museum and the Laban Centre for Movement and Dance. (His mother, Sylvia Bodmer was a notable dancer, teacher and choreographer). Julia Bodmer was also a successful geneticist, playing a key role in the discovery and definition of the HLA system of genetic markers, gaining an international reputation in her work. Throughout her career Julia made significant contributions to the genetics of Hodgkin’s disease, Burkitt’s lymphoma and testicular cancer. 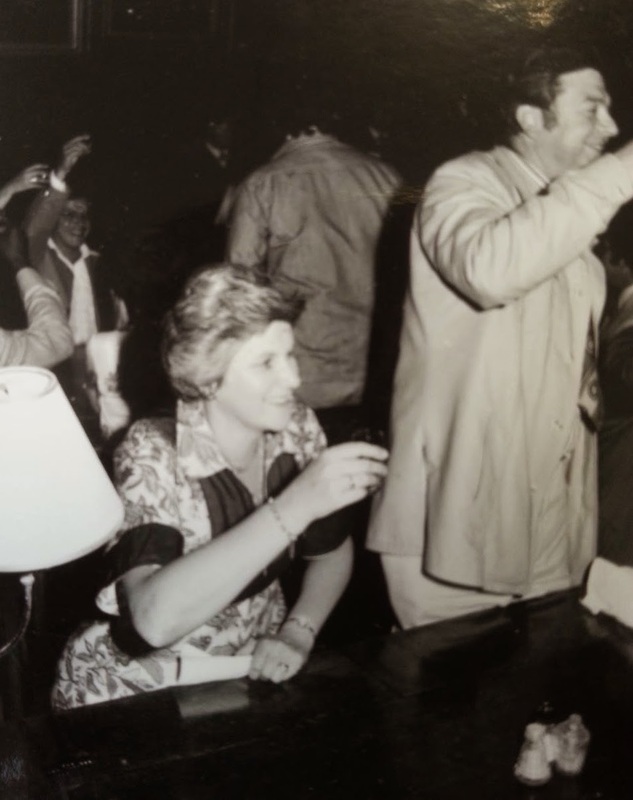 While she collaborated throughout much of her career with Walter Bodmer, she headed up her own Tissue Antigen Laboratory at the Imperial Cancer Research Fund in London (now Cancer Research UK). Although smaller, her archive is nevertheless substantial, and includes not only her scientific papers and records of her professional activities, but also her personal diaries that give an insight into her social world. Julia Bodmer’s papers therefore contribute an important resource to a growing field in the study of the history of women in science. Working papers of publications and correspondence with publishers. The papers are available to researchers in the Special Collections Reading Room of the Bodleian Library. You can view some highlights from the collection in previous posts on this blog. As mentioned in a previous post, Sir Walter Bodmer’s correspondence and research papers feature some of the most notable names from the world of science, and previous posts have drawn attention to just a few of those, including James Watson and Francis Crick. Yet, a particular strength of the archive is that not only does it contain papers relating to prolific scientists who were Bodmer’s contemporaries – and those active in an earlier age who inspired him – but also those starting out in their careers, the scientists of the future. Both Walter and Julia Bodmer kept comprehensive administrative and research records relating to all researchers who passed through their laboratories at the Department of Genetics in Oxford (1970-1979), Imperial Cancer Research Fund (ICRF) in London (1979-1996) and more recently the Weatherall Institute of Molecular Medicine in Oxford. As such, the papers provide a paper trail of ‘future’ scientists. A particular highlight has been uncovering a file of correspondence with none other than the inventor of the World Wide Web, Tim Berners-Lee. 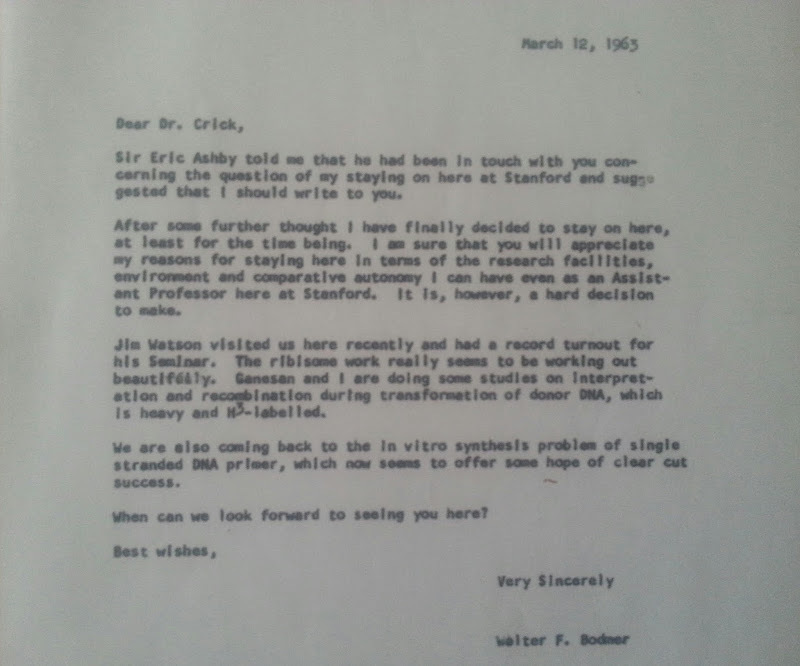 From 1970-1979 when Walter Bodmer was first Professor of Genetics at Oxford University, and it was in 1975 that he received a letter from Berners-Lee, who was interested in gaining some computing experience in the Department of Genetics. The young Berners-Lee had joined Oxford University in 1973 as a physics student at Queens College (graduating in 1976). Accordingly, he joined Walter Bodmer’s Genetics Laboratory for a brief spell of ‘vacation work’ carrying out some computer programming for Bodmer. Berners-Lee indeed built his first computer while he was at student at Oxford. The correspondence file of Berners-Lee in Sir Walter’s archive contains several items of correspondence and annotated notes, mostly relating to Bodmer acting as referee. 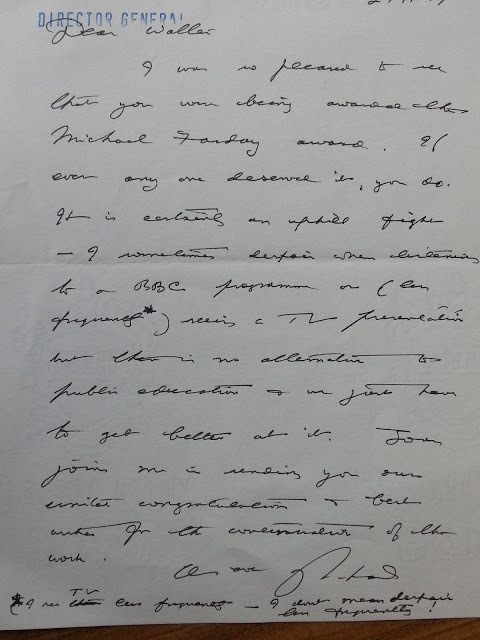 He later wrote to Bodmer in 1976, thanking him for the time spent working in the Genetics Laboratory, of which he said, ‘apart from being interesting at the time, it’s been a useful experience in choosing what I want to do (and probably getting the job eventually)’. Tim Berners-Lee went on to receive a knighthood in 2004 ‘for services to the global development of the internet’. The Archive of Sir Walter Bodmer comprises an impressive sequence of professional, scientific and some personal correspondence. The correspondence spans the extent of Sir Walter’s career, through his early education at Cambridge University to his later career in Oxford. Importantly, incoming letters have been filed with the geneticist’s copy letters, which should prove invaluable for researchers. Cataloguing the correspondence has been fascinating, not least because it really does feature a who’s who of the world of genetics and science. 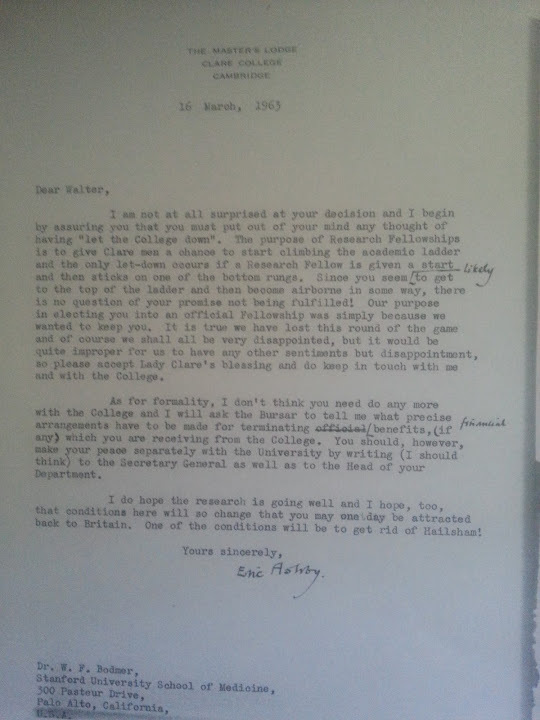 I was particularly interested to find a bundle of correspondence from 1963 between Walter Bodmer, Eric Ashby (later Lord Ashby and master of Clare College, Cambridge) and Francis Crick, one of the founding fathers of Genetics, who, at this time, was based in Cambridge’s Laboratory of Molecular Biology (LMB). Cambridge in fact provided the setting for Bodmer’s early genetics career. Bodmer was first drawn to statistics as a mathematics undergraduate at Cambridge. His interests led to him to the statistically oriented lectures of the Genetics Department by the renowned statistician Sir Ronald Aylmer Fisher. After graduation Walter Bodmer remained in Cambridge researching population genetics under the influence of Fisher (who, in Bodmer’s own words, will always be one of his greatest heroes). After completing his PhD, he stayed in Cambridge on a Junior Research Fellowship and as a Fellow of Clare College and Demonstrator in the Department of Genetics. Throughout his time in Cambridge, it was through R. A. Fisher that Bodmer was exposed to the world of genetics and geneticists, including Francis Crick. Importantly, not only was Cambridge itself the one of the most stimulating environments for geneticists to be, but the period has been marked as the most exciting time in the history of genetics. This was the early days after the discovery of the double helix structure of DNA by Crick, James D. Watson, Maurice Wilkins and Rosalind Franklin (like Bodmer, Watson was also at Clare College where he later became an honorary fellow). My first hearing of the structure of DNA was when Fisher, in one of his very mathematical lectures either in ‘55/’56 or the following year, took out his pocket – and I still remember it – a crumpled copy of a paper that Watson and Crick had written for the Cold Spring Harbor symposium on the structure of DNA. He gave a beautiful description of the structure of DNA, very simple, I have still got my notes on it, then proceeded to go on with a very abstruse lecture on the mathematical theory of genetic recombination or something like that. So that was how I first heard about it, but because of that inter-relationship, Francis Crick was quite friendly with people in the Genetics Department and in my early days as a graduate student there, we had contact with him, and that was an important influence. 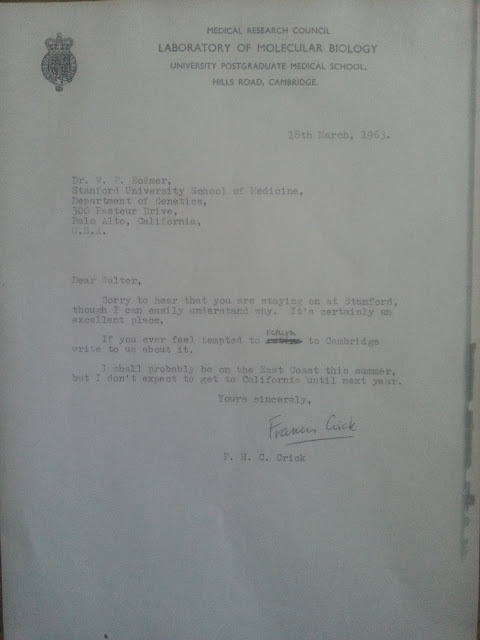 In fact, Francis Crick was a close friend of R. A. Fisher as they were both at Caius College. Through his connection with Fisher and Crick, Bodmer came to have some contact with the MRC Unit at the Cavendish Laboratory where Watson and Crick had deduced the structure of DNA in 1953 (and it was here, in the late ‘50s, that Bodmer was probably influenced to turn towards molecular biology). It was this contact that essentially marked out his subsequent and highly successful career as a molecular biologist and population geneticist. 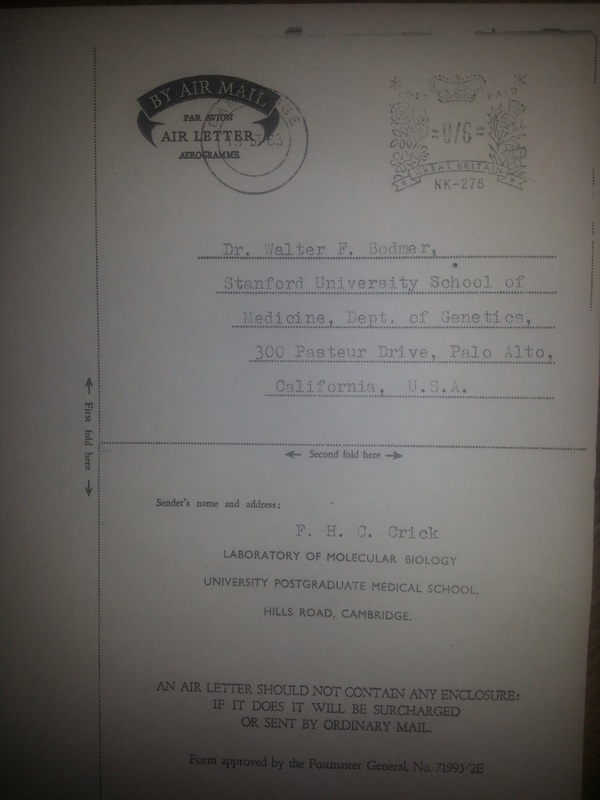 The letters were written when Walter Bodmer was in Stanford undertaking postdoctoral research, and the opportunity to return to Cambridge to further his career in the Laboratory of Molecular Biology was presented to the young scientist. This must have been a thrilling proposition for Bodmer, and it is clear much thought was given to this opportunity, which must have proved a real dilemma. Bodmer had left Cambridge for Stanford in 1961, initially with the intention of staying for just one year. Yet, the young scientist thrived at Stanford where he worked as Post Doctoral Research Fellow to Nobel Prize winner Joshua Lederberg (whose expertise lay in gene exchange in bacteria). 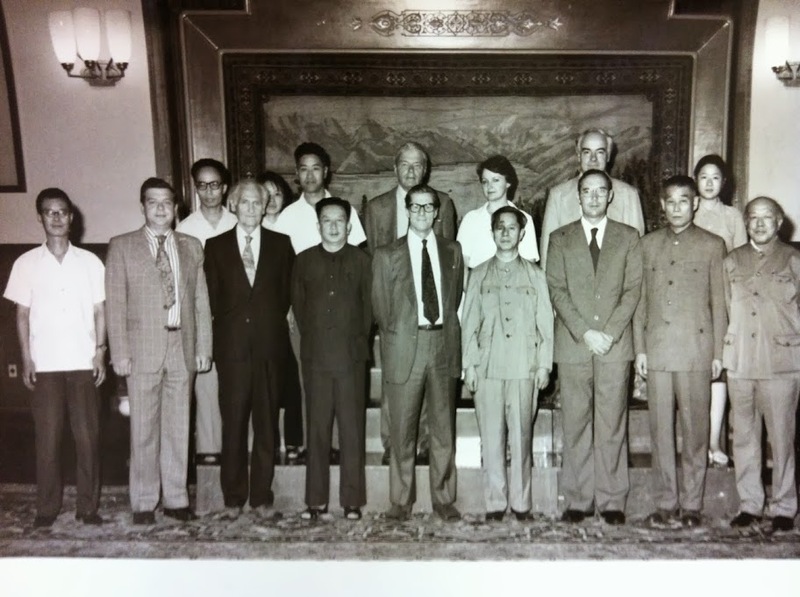 By 1963, Bodmer had been offered the post of Assistant Professor in the Stanford Medical School. 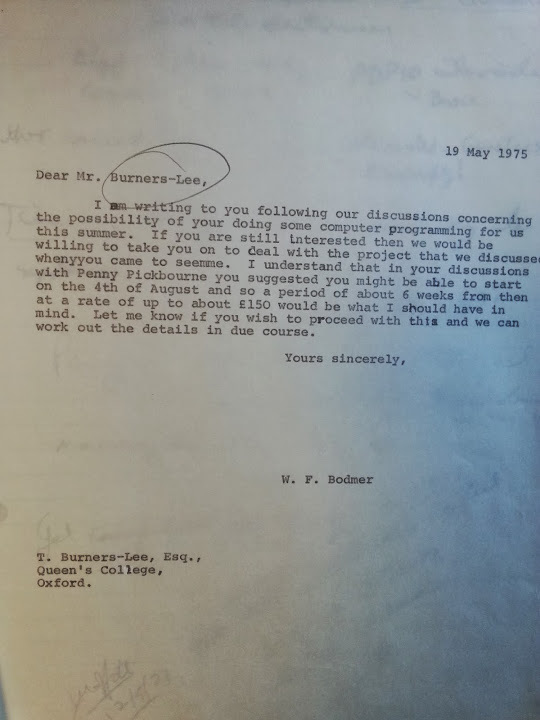 However, as the letters illustrate, there was also the possibility of Bodmer returning to a lectureship in the Genetics Department at Cambridge. 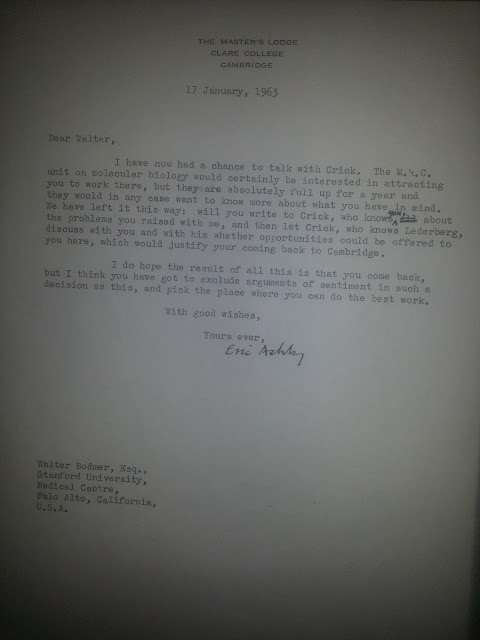 While an established position with the prospect of tenure, he may not have considered this to be the best option given his switch to an interest in molecular biology (as illustrated in the letters, Eric Ashby and Francis Crick were trying to arrange a more attractive position at the Laboratory of Molecular Biology). In addition, Clare College had separately offered to make Bodmer an official Fellow if he returned, also an established position. While in America, Bodmer became drawn to studying the more biochemical and molecular aspects of genetics. On his way to Stanford in 1961, he attended a course in molecular biology at Cold Spring Harbor Laboratory in New York, one of the great meccas for molecular biologists. By 1963 (when the letters were written), Walter Bodmer had established a strong career in molecular biology, and was working more or less independently in the Lederberg laboratory in Stanford. He then moved to work on somatic cell genetics, which would become a lasting involvement throughout his career. Another major research area initiated during his time at Stanford was with his wife Julia Bodmer, on work that contributed to the discovery of the major human histocompatibility system, HLA. 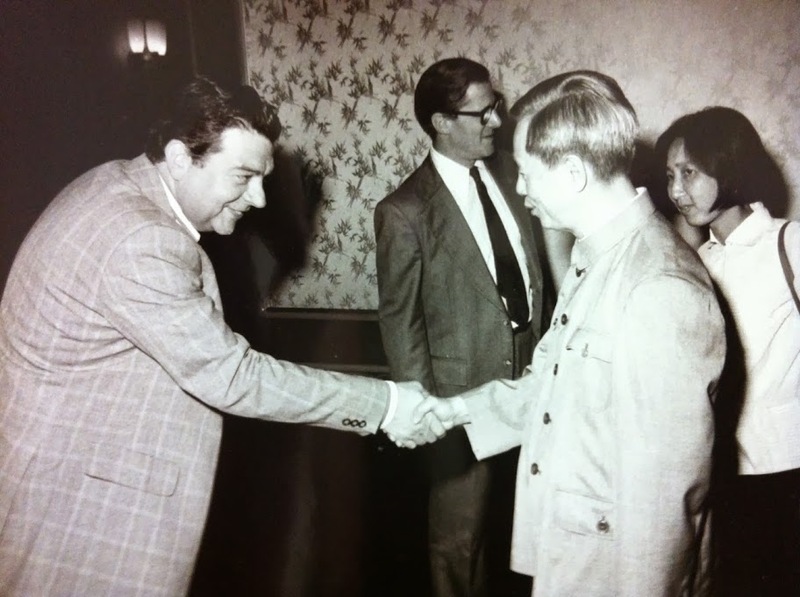 During his time in Stanford, Walter Bodmer had also made contact with Luca Cavalli-Sforza, whom he first met in Cambridge around 1957. 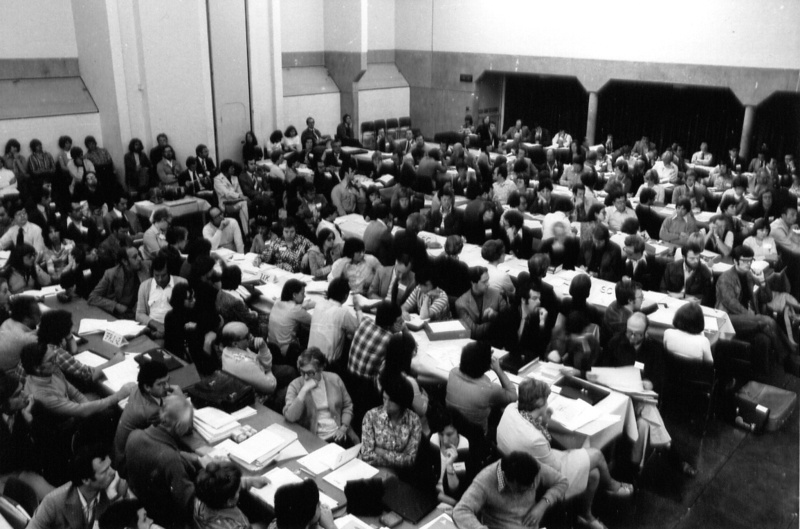 In Stanford they they began working collaboratively by giving a course in population genetics and working on text book the Genetics of Human Populations (published 1971). The possibilities offered in Cambridge really must have involved painstaking decision-making, yet as is clear, his time in Stanford really solidified his successful career and he remained here until his return to the UK in 1970 to take up the Chair in Genetics at Oxford University. It is evident, both in the letters and other papers in the archive, that Bodmer’s potential as a scientist was recognised at an early stage in his career. Over the next few months I hope to highlight further gems from Sir Walter’s archive that capture his influences from the world of science. The Saving Oxford Medicine project team would like to congratulate Sir Walter Bodmer on his recent award of a Royal Society ‘Royal Medal’ for his contributions to science and genetics. This award, from the oldest and most prestigious scientific academy in the world is given annually in recognition of the recipients achievements and contributions in the physical, biological and applied sciences. Previous winners of the Medal have included the biochemist Frederick Sanger, molecular biologists Francis Crick and Max Perutz, and the epidemiologist Sir Richard Doll. Sir Walter is also a previous winner of the Royal Society Michael Faraday Prize, which is awarded for communicating science to UK audiences. The letter below (from the Archive) is from Richard Doll, congratuling Walter Bodmer on this prize. The Michael Faraday Prize was made in recognition of Bodmer’s role in the Public Understanding of Science enterprise, which, under the auspices of the Royal Society, sought to uncover the public’s awareness of science. This culminated in the influential 1985 publication The Public Understanding of Science, (or Bodmer Report), which made signinficant impact on the Government and the scientific community. Sir Walter became a fellow of the Royal Society in 1974. The Bodmer archive is a valuable modern science collection, not only for its importance in documenting the history of human genetics and scientific initiatives, but also for revealing changes in laboratory methodologies and practices. 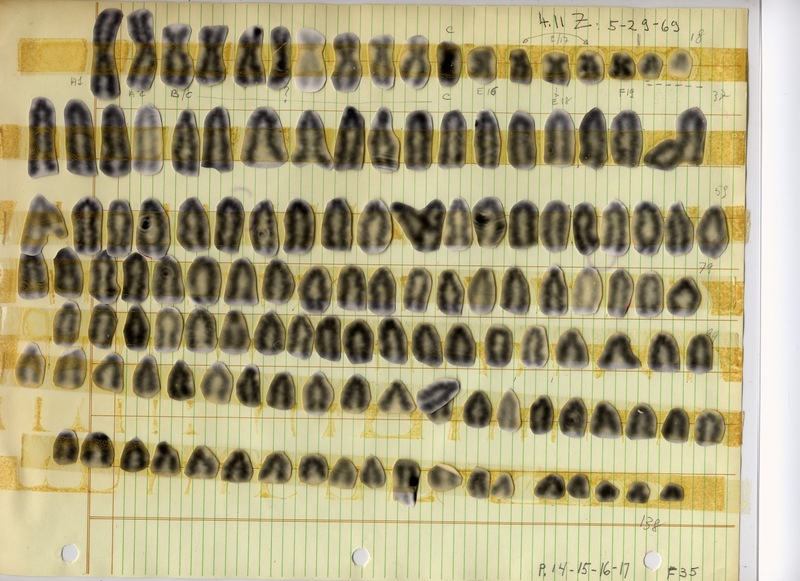 One of my favourite finds relates to chromosome analysis carried out for work on human gene mapping using mouse somatic hybrids of human-mouse cells and human leukocytes, undertaken by Walter Bodmer and the his then PhD student immunologist Marcus Nabholz. Nabholz worked and collaborated as a graduate student in Walter’s lab at Stanford University, and also later at the Genetics Laboratory in Oxford. 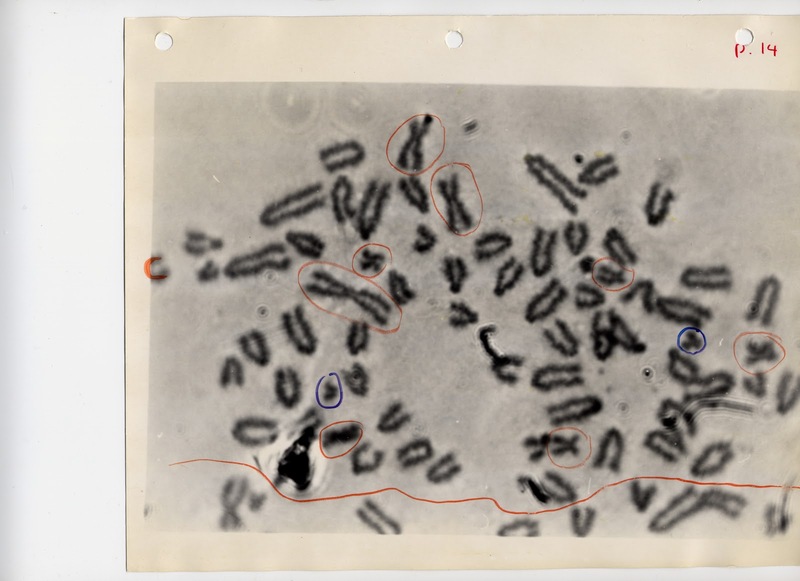 The images below illustrate chromosome analysis, which involved taking a print of chromosomes in dividing cells, cutting them all out individually and arranging them crudely by size and shape. This work contributed to a joint publication that appeared in 1969 edition of the jounal Nature entitled ‘Genetic Analysis with Human-Mouse Somatic Cell Hybrids’. This chromosome technique may appear as quite primitive laboratory practice, and such relatively crude miscroscopic images of chromosomes would not end up on paper now. The Bodmer collection perfectly illustrates how technological changes over the last 50 years have fed into scientific research, from the techniques illustrated above, to the latest cutting-edge computer analysis, which is now integral to scientific research. The archive contains a considerable amount of material that will enable researchers to trace the development and application of information systems and software technologies in science laboratories. 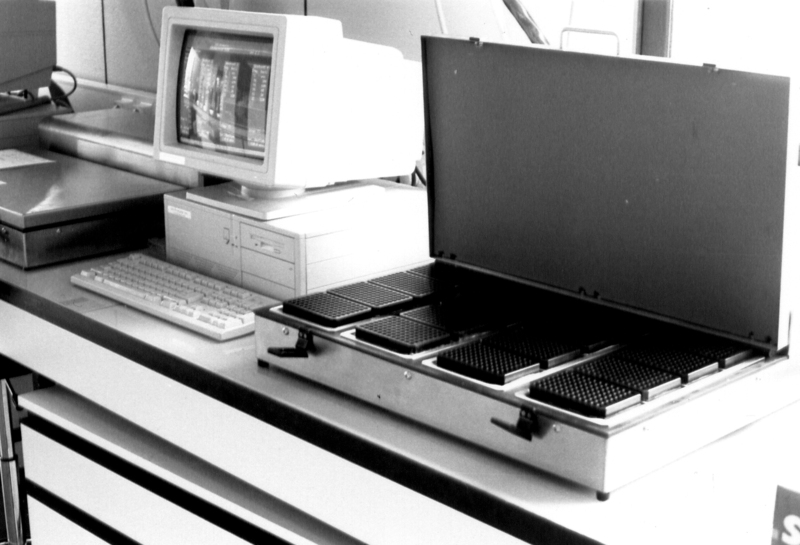 From the earlier period of the Bodmers research when laboratories entered the electronic world, computers became especially important for geneticists. 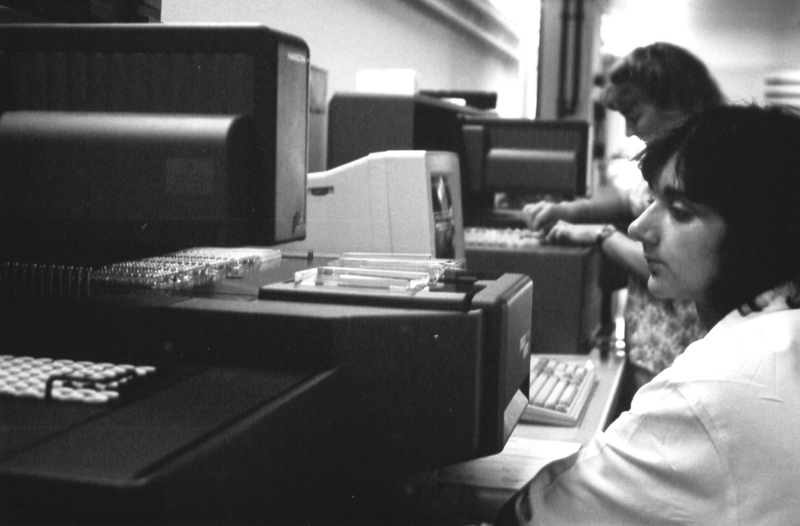 Julia Bodmer in particular -with her abilities in handling and analysing large datasets- embraced the application of computers to population genetics at an early stage at Stanford University, where computing facilities were better than most. Although a novelty in science and medical research at this time, they were mostly used for data crunching in the earlier period, yet computers would play a vital function in the interpretation of serological data. Julia in fact created a computer program that facilitated the identification of the first two genes of the HLA genetic system. 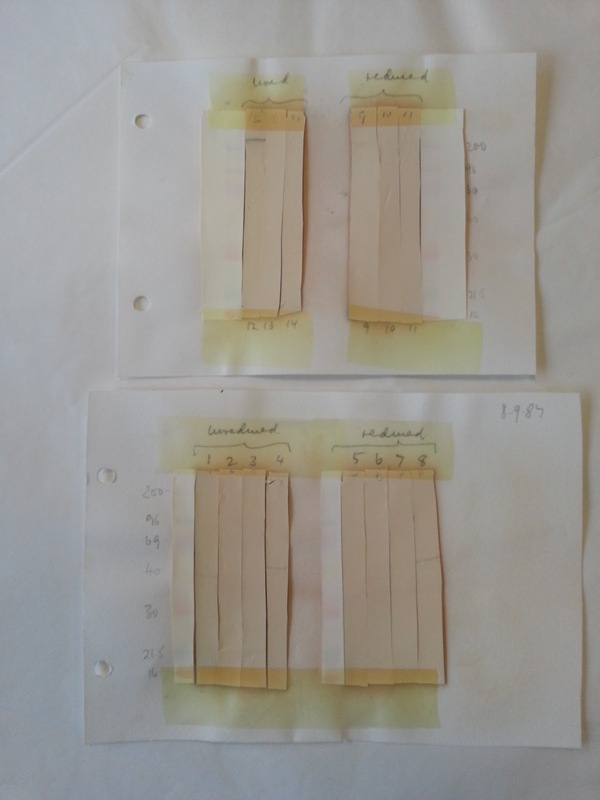 As traditional laboratory notebooks are increasingly eliminated in favour of electronic notebooks, which are often erased or deleted after publication output, the preservation of paper-based research notebooks and scientific data found in the Bodmer collection (a hybrid paper and digital collection) will be an important resource for documenting the history of genetics. Sir Walter and Lady Julia Bodmer’s archive covers nearly all aspects of their research careers as geneticists. While it is often the case that scientists discard research papers (or delete digital files) such as laboratory notes and datasets once the scientific conclusion results in published output, Sir Walter has been careful to retain every step of the research process leading up to publication. The archive includes sequencing and other experimental data sets, punch cards, lab notes and log books, multiple drafts of scientific papers and grant applications. Importantly, the more informal aspects of the research process have also been kept, adding a real human dimension to the archive. The correspondence, casual memos, jottings and annotations on reprints and lab notes encapsulate the ideas and observations, not to mention the frustrations endured throughout the research process, and ultimately, the thrill of scientific discovery. 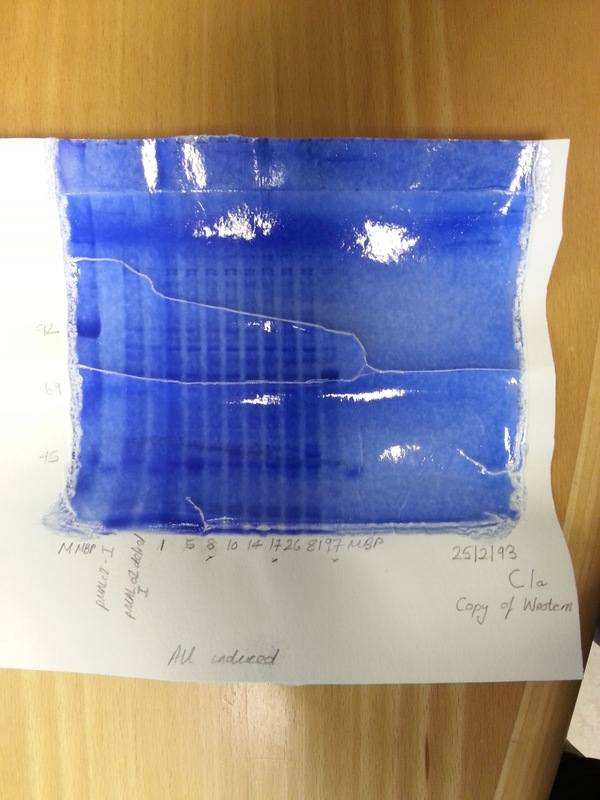 For this post I thought it would be useful to share some examples of the experimental materials enclosed in many of the lab notebooks. The archive comprises an impressive amount of lab work making up around a third of the full archive, which totals over 2000 boxes. This also includes the notebooks of collaborators and junior research staff working in various labs headed by the Bodmer’s in Oxford, Stanford and the Imperial Cancer Research Fund (now Cancer Research UK) in London. The collection’s research sequences include Sir Walter’s early genetics work on Aspergillus and Neurospora, which he carried out as a postgraduate student at Cambridge University during the 1950s and until he went to Stanford in the 1960s. This covers molecular genetics experiments on DNA transformation in Bacillus subtilis, and work on human lymphocyte antigens. 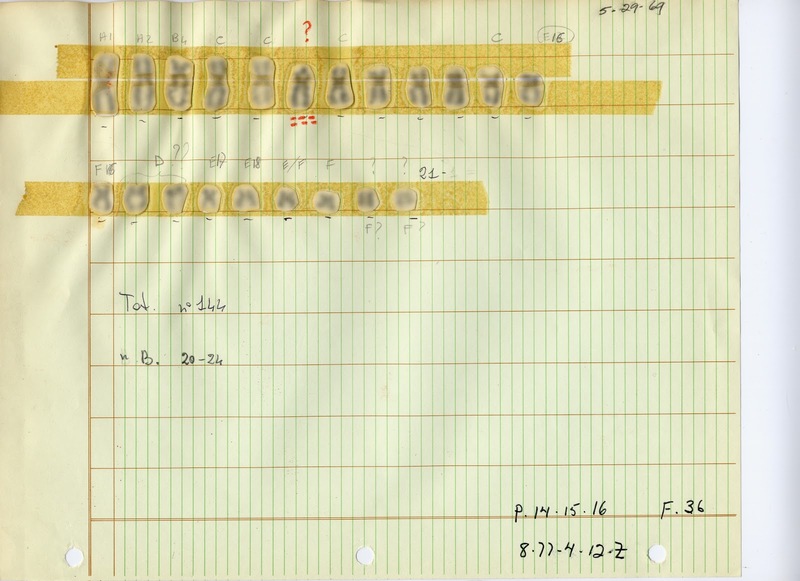 From the Genetics Laboratory at Oxford University research notebooks cover a variety of experiments throughout the 1970s, including those relating to HLA determinants on somatic cell hybrids. There are nearly 200 boxes alone containing lab notes from Julia Bodmer’s ICRF Tissue Antigen Laboratory including work on the production of monoclonal antibodies, in particular, DR antigens. There are also a similar number of boxes relating to colorectal cancer research carried out in Sir Walter’s Director’s Laboratory at the ICRF. Many of these papers offer a window into the development of techniques and methodologies used for work on extracting proteins and DNA. 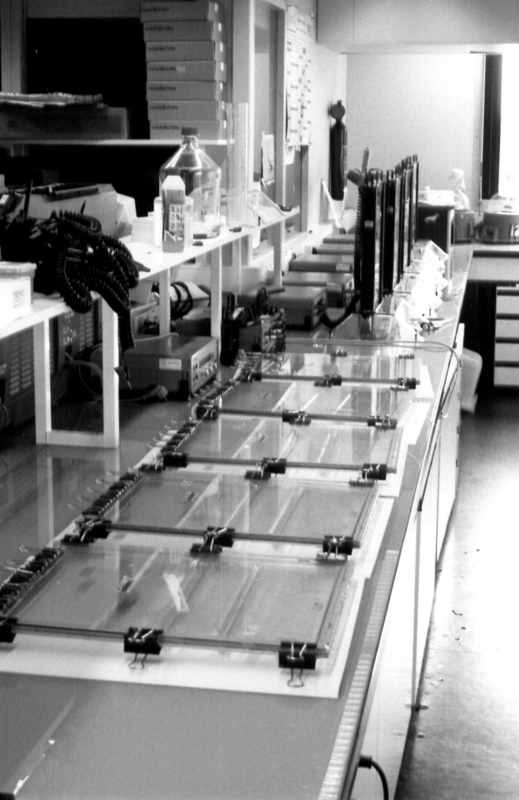 These images represent a small selection of lab techniques such as Western and Southern blotting, and gel electrophoresis. 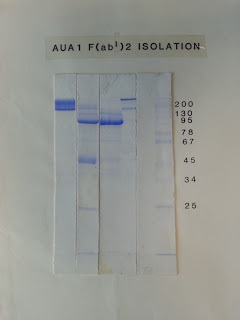 The technique of Southern blotting was developed by Sir Edwin Southern in 1973, and uses gel electrophoresis for the detection of a specific DNA sequence in a sample of DNA. 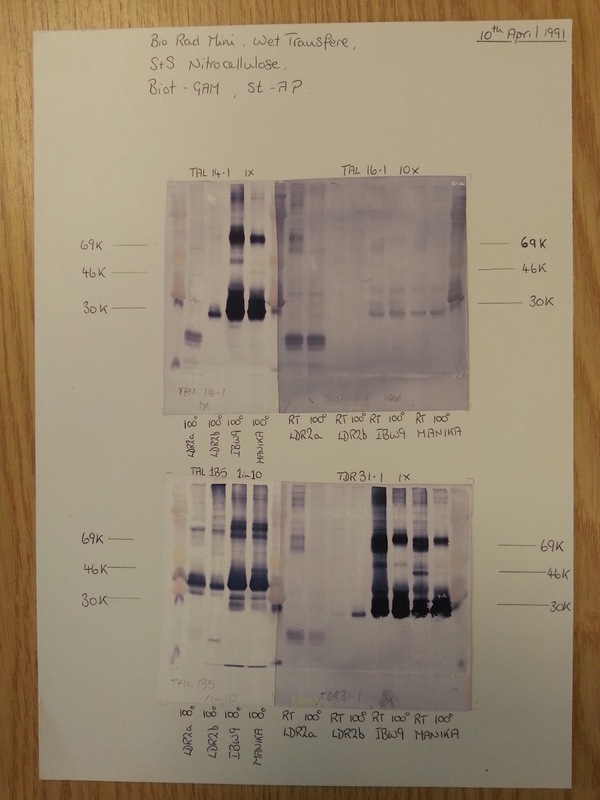 Western blotting is similar but is used to detect and separate proteins, thereby allowing for the identification of specific antibodies (while Northern blotting detects RNA). 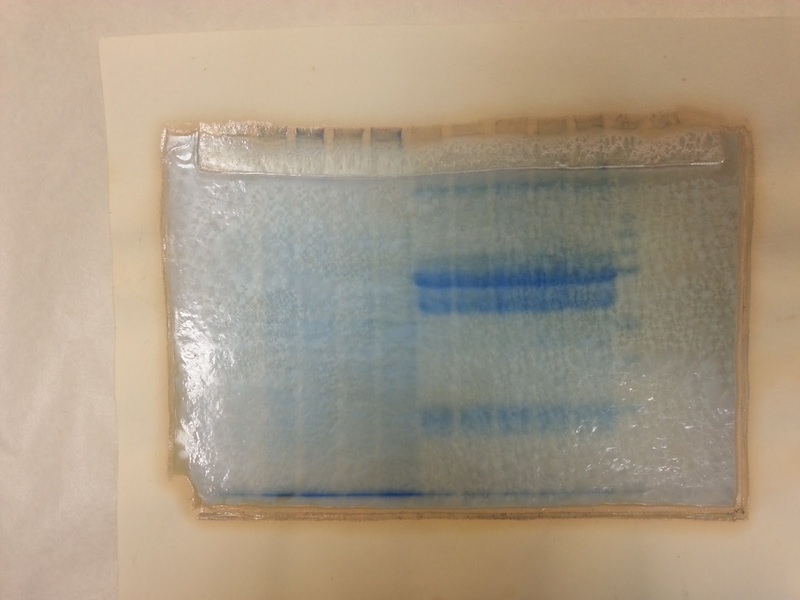 Blotting by gel electrophoresis enables the transfer of membranes and involves hybridisation to a probe. 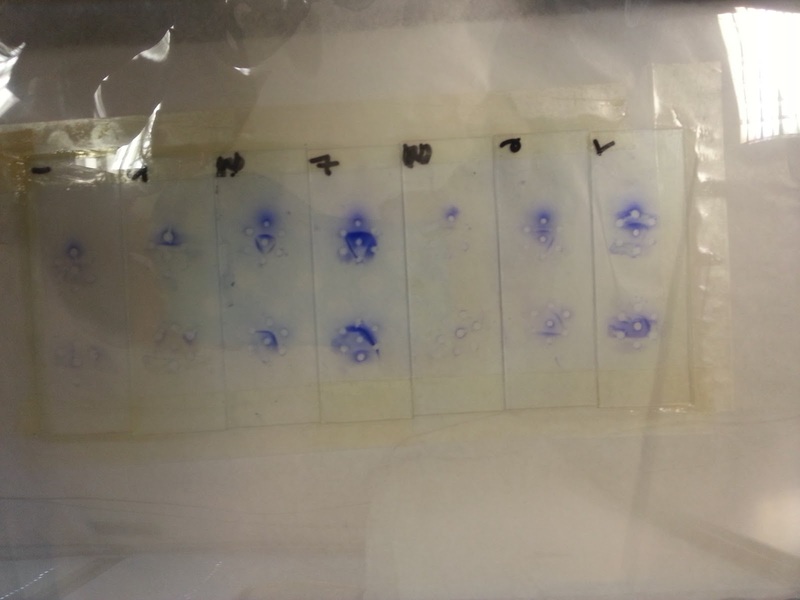 There are also a number of dot blots, which is a method of applying proteins directly onto a membrane. 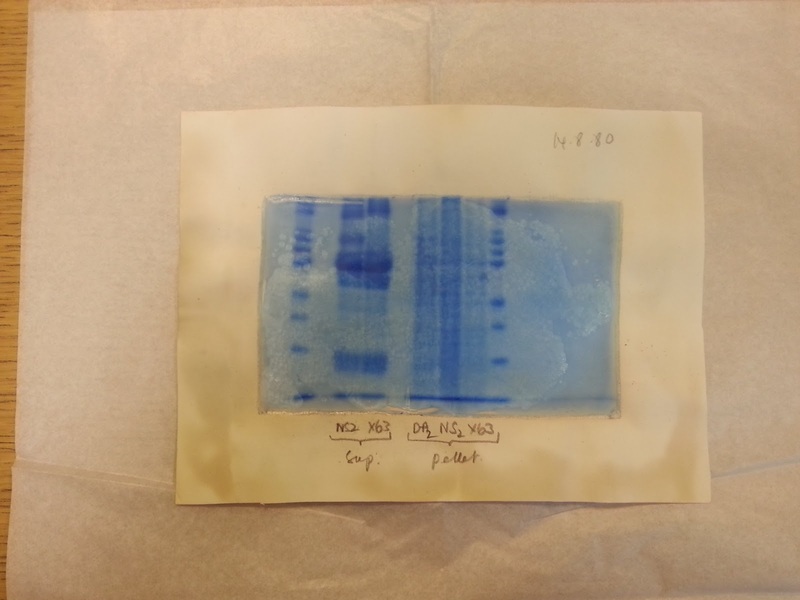 Unlike Western blotting, it does not use electrophoresis to separate proteins. Sample proteins are applied directly on a membrane as a dot and hybridized with an antibody that acts as a probe. 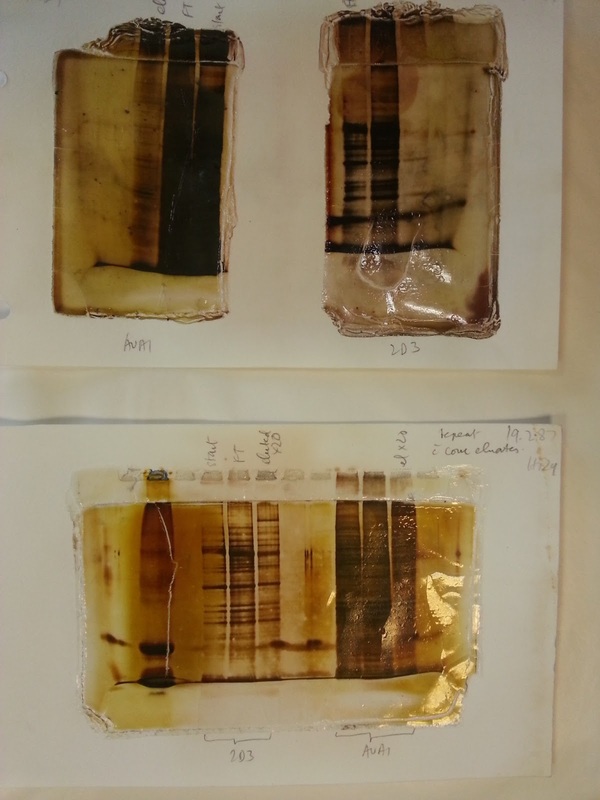 From an archivist’s perspective, the laboratory materials are both fascinating and unusual, and have also posed many preservation challenges concerning long-term protection of the archive. The generous support from the Wellcome Trust has enabled us to safeguard these important materials in order to ensure their long-term physical survival and make them accessible to future researchers. As such, we have worked with the Libraries’ preventative conservator and health and safety representatives to find the most suitable enclosures for these materials.Thankfully the majority of lab material is in an excellent and stable condition with no degradation, and we have been taking protective steps to ensure future degradation is minimal and avoids crosslink and damage with other materials. Preservation measures have included the use of acid absorbers and archival quality non-acidic repackaging material. Importantly, the majority of the collection has been retained (by the Bodmers and now archivist) within its original order and context. For a non-scientist archivist, the abundance of explanatory documentation that exists with the laboratory papers has proved invaluable for contextualisation, and will also add to the collection’s historical value. Cataloguing of the Bodmer archive has been underway for around six months now, and it has been fascinating to learn about the sheer scope of Sir Walter’s career. There have been many dimensions to his work, and importantly, national science policy and science education has clearly been a real concern for the geneticist. In 1985, Bodmer chaired a Royal Society committee that sought to uncover public attitudes towards science. Included in the archive are papers relating to the Public Understanding of Science (PUS) and the Committee on the Public Understanding of Science (COPUS), groups set up by the Royal Society. It has been argued that the PUS movement (more recently Public Engagement with Science and Technology) developed as a consequence of the Royal Society’s influential 1985 publication The Public Understanding of Science. Written by Walter Bodmer, it is also commonly known as the Bodmer Report. The purpose of the Report was to recommend initiatives for government, schools, universities and media amongst others (including scientists themselves) to work together in order to promote a scientifically literate population. The Report can be read here. The Report also aimed to encourage a better relationship between scientists and the public, and in particular, that scientists communicate more effectively to their audiences. One of many issues addressed was the public image of scientists. A decade earlier, the New Scientist conducted a nationwide survey in an effort to monitor the public’s attitude to and awareness of science and scientists. According to the Bodmer Report, the outcome of the New Scientist survey “was a mixed bag, with scientists seeing scientists as typically approachable, sociable, open, unconventional, socially responsible, and popular with broad interests, while non-scientists saw scientists as typically the opposite”. Similar attitudes prevailed in later surveys carried out by various groups that submitted their findings to the Royal Society, as illustrated below. 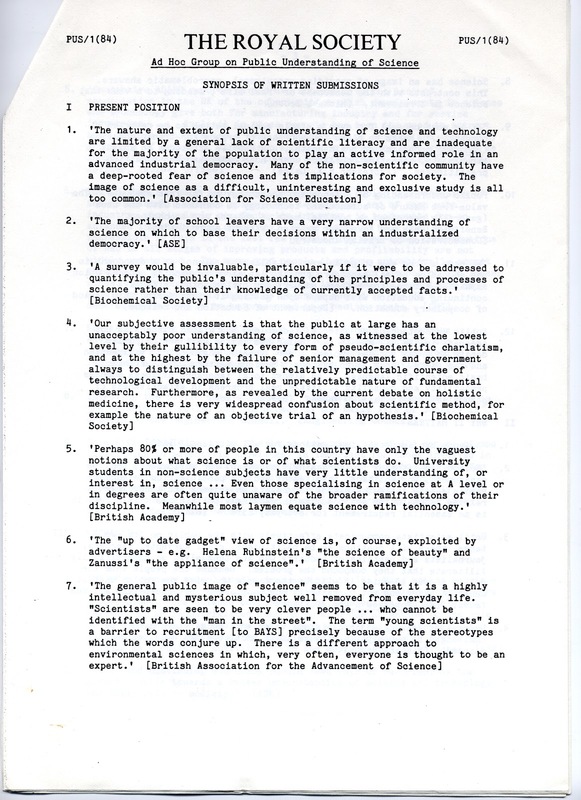 Example of written submission to the Royal Society from various societies including the BritishAcademy and British Association for the Advancement of Science (1984). The papers of Sir Walter and Lady Julia Bodmer reveal this apparently common public perception of scientists could not be further from the case, and the personalities that come across in the archive are a far cry from the stereotypical scientist ‘who cannot be identified with the man on the street’. The papers (including many photographs) reveal a couple that were not just hard-working and committed to their careers and family, but also relaxed, sociable and popular. 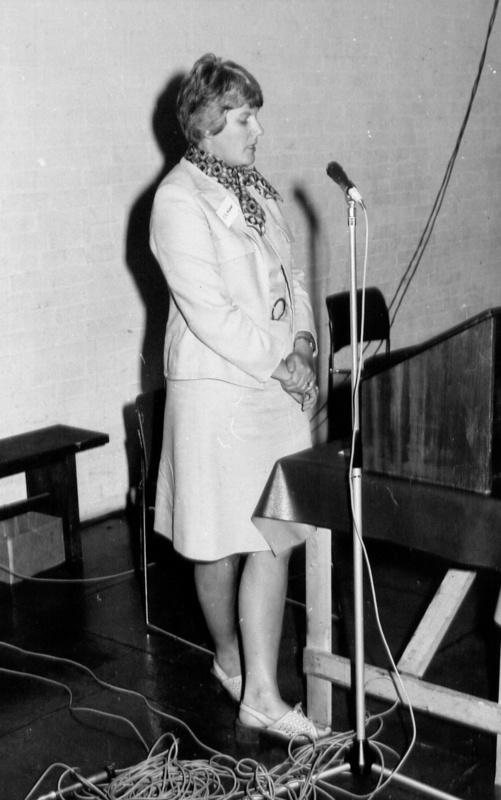 After Lady Bodmer passed away in 2001, an obituary recalled ‘her strength, her humour, her infectious enthusiasm [and] her dedication to science’. A former colleague remarked, ‘I like to recollect Julia in her apartment at the top of the ICRF when Walter was playing piano and we were just having a friendly talk’. Music and the performing arts appear to have played an important part in the Bodmer’s lives. For instance, the collection includes papers concerning Sir Walter’s time as a Trustee and Chairman of the Board of Directors at the Laban Centre for Movement and Dance (now Trinity Laban). In fact, Sir Walter’s connection with Laban originated with his mother Sylvia Bodmer (1902-1989), who gained a reputation as one of the most distinguished exponents of modern dance and movement. Having danced as one of Rudolf von Laban’s pupils in Germany during the 1920s, she continued with her career in dance, choreography and teaching after moving to England. One of the quirkier parts of the collection I have come across recently perfectly captures the Bodmer’s sense of fun and love of music. 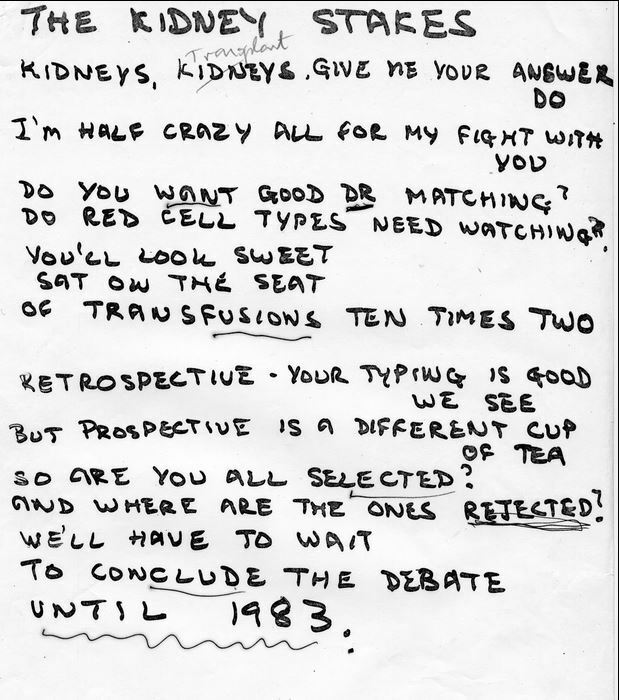 The images highlighted here are an example of several songs and sonnets that were buried in a box of material relating to an International Histocompatibility Workshop. 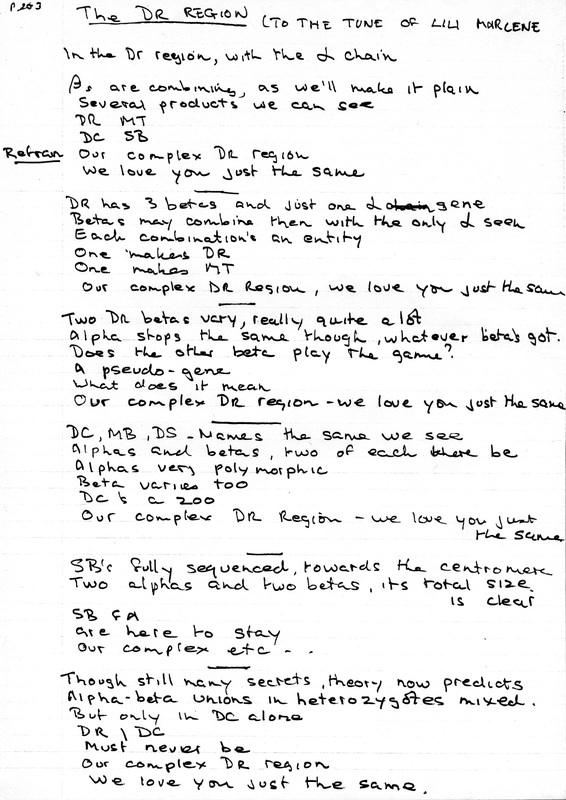 Written in Julia’s hand, the songs were intended for post-conference entertainment, possibly the event hosted by the Bodmers in Oxford, 1977. I never fully appreciated quite what to expect with a scientific archive, apart from the more predictable research and teaching related papers, and it has been fun uncovering some real gems in the collection. The archive stretches well beyond the laboratory and the world of science and genetics, offering a window into the lives of two prolific geneticists who enjoyed a broad range of interests and pastimes. During the early period of Sir Walter Bodmer’s career in Oxford (1970-79) he was able to dedicate his time to research in addition to teaching. The papers of Sir Walter and his wife, Lady Julia, illustrate the development of their valuable laboratory research into human gene mapping, and work on the human leukocyte antigen system (HLA), which they initially collaborated on at StanfordUniversity in the lab of haematologist Rose Payne.In the new Genetics Laboratory at Oxford University, the couple progressed with their HLA research. Walter Bodmer also continued his work on somatic cell genetics and the biochemistry of HLA. Julia had a particular interest in studying the relationship between HLA types and diseases. The gene mapping aspect of genetics and the role of HLA in disease association was flourishing during this period as a major field of research. 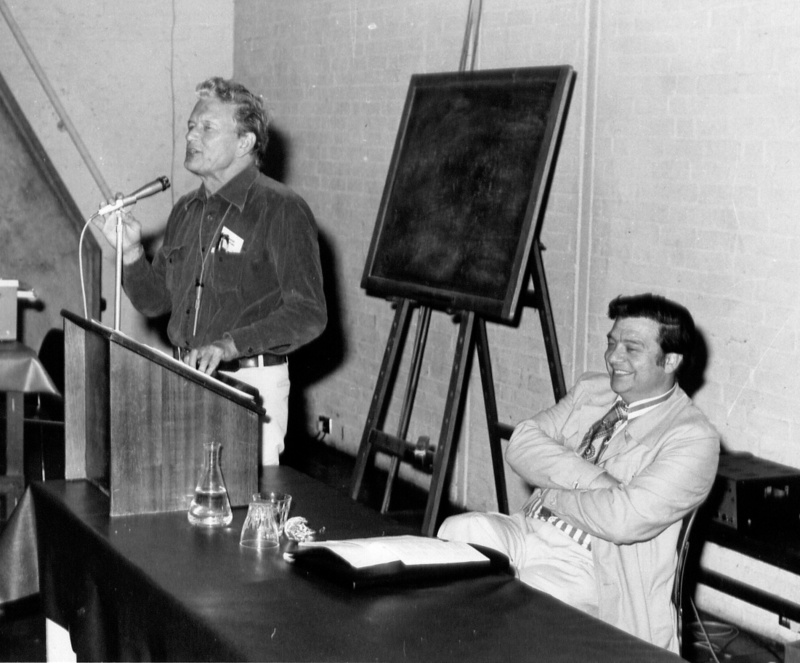 The first international HLA Workshop Conference had taken place in 1964 at Duke University, North Carolina, and would continue to be a seminal event. The Workshops provided scientists with a forum to collaborate on their investigations into immunogenetics research. In September 1977 Walter and Julia Bodmer were responsible for bringing the Workshop to Oxford University. Approximately 200 laboratories scattered worldwide participated in this Workshop, studying antisera, lymphocytes and typing cells. It was during this Workshop that HLA-D region types were properly defined for the first time, a major step forward in the HLA field. Additionally, as a consequence of the conference, 19 new HLA specificities were given World Health Organisation (WHO) designations. In 1979, the Bodmers left Oxford for the Imperial Cancer Research Fund (ICRF) in London. 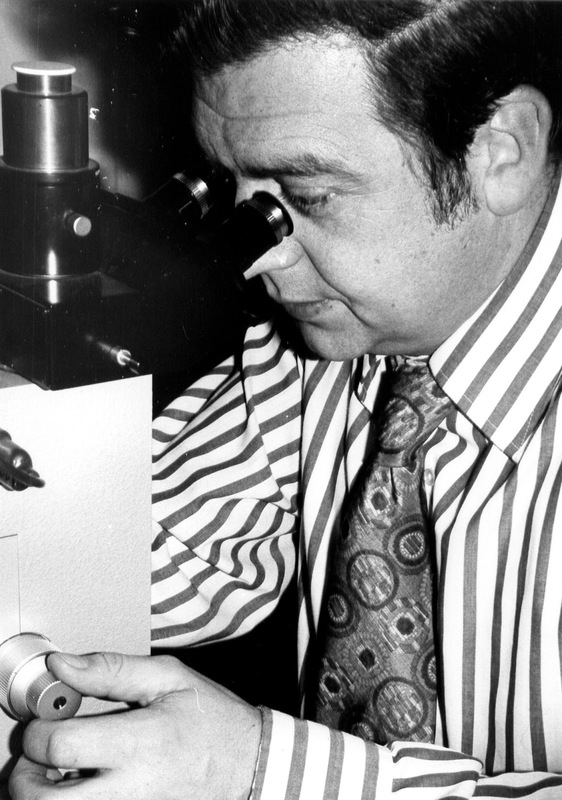 Sir Walter eventually became Director-General of the ICRF while Lady Julia was head of the Tissue Antigen Laboratory.